I hit a major milestone in life early November. 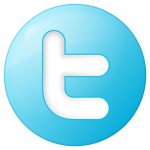 I turned 50! I think I embraced it pretty well. I can recall when I turned 30, for an entire week before and after the birthday, I believe I was a jerk. I really had a difficult time hitting 30, as I felt hitting that number I was no longer a kid. Life certainly does fly so my hope for you is that you embrace every day you’re blessed with on earth. A couple of months before this special birthday, I started searching for a bottle of the vintage port of my birth year. 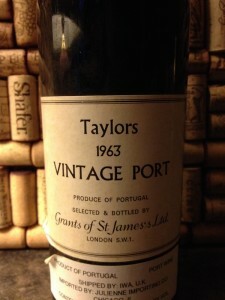 After a couple of internet searches, I found a couple of bottles of 1963 Taylors Vintage Port from a wine bid company. I immediately created my account so I could join the bid. I lost the first round and I was bummed. I really wanted to buy one of the bottles. Soon thereafter I came across another bottle up for bid. 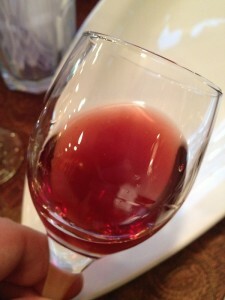 I read the reviews on the wine and examined the pictures. 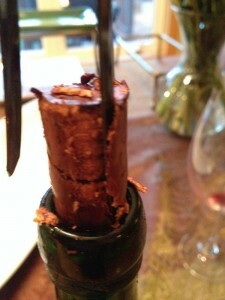 There was a little seepage at the cork and was told the bottle was held in a climate controlled cellar. I wanted this one bad. I placed my initial bid and a few days later someone outbid me by ten dollars. Now I was just mad. I decided that I was not going to play the bidding war and instead I decided to hang tight and only place a bid one minute before the auction closed. The bid was closing at 8 pm pacific time and I logged in five minutes before the closing. The price remained ten dollars over my bid. and I watched as the time ticked down. With only thirty seconds remaining I placed my final bid so there was no way someone could see the bid and react in time. As luck would have it ( a skill I figure) I won the bid! I was stoked and had to share my victory with Chris! 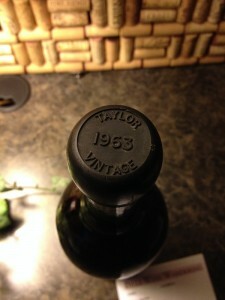 The 1963 Taylors Vintage Port showed up about a month later and I immediately put it into my wine cooler. Then all I had to do was wait till my birthday arrived. November came and this time, I wanted a party to celebrate and share life among friends. 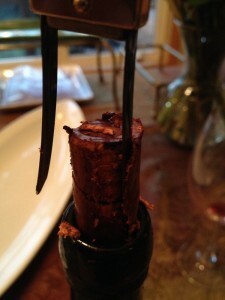 Before everyone arrived, I decided it was time and I pulled the bottle from the cooler to prepare for the corks removal. 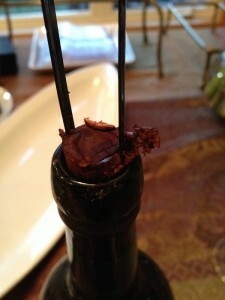 You can see the cork was really soaked with Port. I will keep the cork because it was a pretty big deal. Once the cork was removed I grabbed my tasting sheet and poured four glasses to share with Chris, Pete, and Martinique. 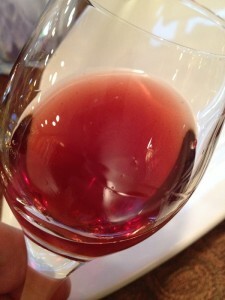 The vintage port was a light ruby color. The meniscus remained tight and it was cloudy in my glass. 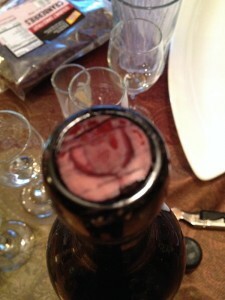 I suspect if the bottle sat vertically a couple of hours the sediment would have settled. The Port was very aromatic and old with nice caramel notes. My initial taste was sweet like port should be. It was medium bodied with perfect acidity. We felt tannin’s and it was slightly astringent. This port could live for many more years! It was very flavorful with a long finish. How much: $265 and worth every drop! I shared my port with a few other friends during the night. 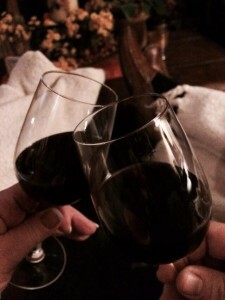 My financial advisor and his wife too enjoyed a glass and though they had not experienced port previously, they too enjoyed it. When I told Jim the price he said: “we need to talk”. I believe this was a real treat and I can’t put a price on a great bottle of port. I sucked the air out of the remaining port and plan on sharing the rest with my love next weekend. Well, it actually made it a couple more days. After dinner, one night Chris and I finished the bottle. 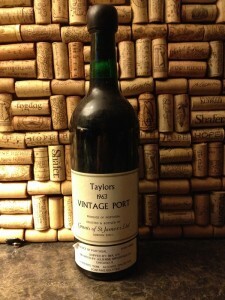 If there is a Taylors Vintage port with your birth year on it, I strongly recommend that you buy it.